Denmark applied gentle transition rules on migration from the NMS in May 2004 and further eased the access to its labour market in 2006 and 2007. 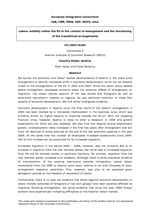 We summarise the available evidence on the extent, composition and effects of migration from the NMS to Denmark after 2004. While the inflows from the NMS increased substantially in 2006 and 2007 with respect to their initial levels, the share of the NMS workers in the Danish labour force remains relatively low. Most migrants come from Poland and the Baltic States, are relatively young and many are employed in the construction and agricultural sectors. There is no evidence that migration from the NMS has led to any imbalances on the Danish labour market. Instead, it has helped fill labour shortages and sustain economic growth. According to the revised (29 June 2007) agreement of the transitional scheme, Denmark will introduce the Community rule of free movement without restrictions in May 2009.